Quick question, how will the OnLive partnership with OUYA be affected by the recent news? I don't know much about ABC process, but since it is not publicly known (AFAIK) who is taking over OnLive, could this partnership be blocked if it were to say be taken over by a competitor in the Game Console space such as SONY, Microsoft etc. I think OUYA will be great either way, just wondering about this. I must be seeing things differently then, because zooming in I can see (from left to right) a power port, a usb slot, an hdmi port and our little added ethernet port. with how open this console will be, i would imagine that it could have a spot for an extra usb port, if you wanted to manually add one yourself. that way it would still be upgrade-able in that aspect, and still easy to produce within cost constraints. it looks like there's a spot for an extra usb slot....posssibly a usb 3.0 slot??? only hours left. i really agree with the guy who stated a modular controller were you can swap out the button configs with simple USB hookups. i dont know how do-able that is but it would be absolutely revolutionary. visable screws on the top make this look great. But as you've said. It is an open console. So if you don't like, change it. There are more consumers than modders, and I see that as a problem. You want the OUYA to look a certain way. Don't live life as a consumer, become a modder. What better way to start than with the OUYA. I like the look of the screws visible on top. Something I would like to address that I so far haven't seen anyone else address yet, are the openly visible screws on top of the Ouya console box. I think the overall design and the minimalism of the Ouya is awesome. It's very appealing. I also understand that by placing the screws right there in the open allows for the device to feel "hackable" and "open", which has been a marketing point used heavily by the Boxer8 team. I fully understand this. But, from a designer standpoint, I feel that leaving the screws openly visible in this fashion make the console feel "cheap and dispensable". The screws detract from the overall "wholeness" of the product. If you take a look high-end well designed products, the screws, or any piece that holds the device together, are rarely ever, if ever, visible. Now, I am not making the point to seal away the screws and take away from the "open-ness" of the device. I would actually just like to suggest something like an easy "pop-off" cover with a square cut-out in the middle that could cover the top of the Ouya, simply hiding the screws and giving the device a "clean" and "wholesome" appearance. As there are more consumers than hackers out there, I feel this would be overall satisfying. Anyone who wanted to get into the guts of the device just has to simply remove the pop-off cover and reveal the easy to remove screws. This way, you keep the device "open", yet still clean all in one sweep. I actually find this to be one of my biggest concerns of the Ouya and it's design. I *had* added $30 to my pledge for a second controller, but I've already downsized that because of the d-pad design combined with the d-pad/left stick layout - I don't want a second controller that's going to be a major pain for me to use. I have no doubt that the controller grips are designed pretty well, but IMHO dual sticks should always be aligned and any new d-pad needs to be clearly a d-pad *and* needs to work accurately all the time. As with many people here, the d-pad design troubles me. It should be very precise, and I dont think a circular pad would lend itself to that. I also think the sides of the controllers look too long, but without really holding it in my hand, I cant tell if it would be comfortable the way it is. Will On-Live be avaiable in Europe then? I have to agree with everyone else about the disc shaped d-pad, I really hope they will reconsider redesigning it for the release. I'm going to have to cancel my second controller too because of the d-pad design and position. Unplayable without serious risk of carpal tunnel syndrome. As stated before me: analogue sticks should be aligned! I totally agree with the criticism against the d-pad style and the d-pad/left analogue locations. As someone else mentioned, katamari damacy essentially requires the analogue sticks to me in line, and that's a game I'd seriously love to see on the Ouya. Also, every single time I've tried to use an xbox-layout controller, it's completely destroyed my gaming experience. If 3rd-party usb controllers are easily usable, I'll cancel my order of a second controller and just get one of those. OnLive on the OUYA will be awesome. You made me change my mind. You are actually right.
" This is only my own personal view, but I'm after a gaming machine, new games, emulators etc. I'm not interested in music video." Yeah, I want a gaming machine. You can add whatever services you may want, as along as I don't have to even hear about them while using my Ouya. I just want to play games with it. On the exploded view above it looks like the PCB is mounted upside down in the OUYA, will the Tegra3 get mounted on the bottom side? I mean the tegra3 is known to get quite hot, from cooling point of view this might not be the best option? Or will the console get a fan for cooling? Yes! The O.U.Y.A. action button idea sound great! Agreed with Kian and Tyler, that d-pad needs to be deconstructed. I personally hate clunky, solid D-Pads. Love the O.U.Y.A. action button idea though! Yeah, The O.U.Y.A buttons layout sounds like a great idea, really. And it would be nice to have the option to either have Xbox-style analog sticks or parallel. Maybe making them removable and interchangable with the dpad? Just thinking, that way you can please both party control gamers. Definitely fix the D-pad and the analog sticks. I dont know about changing the buttons to O U Y A... but I guess it can work. Break up the DPad buttons and change the symbols from 4 O's to O U Y A and you got yourself a winner! I forgot how bad the d-pad is for xbox. I've used the Playstation Dualshock for a majority of my life. I Guess that's 2 major issues they need to fix on the controller then. We need symmetrical analogs AND a good d-pad. We need an UP DOWN LEFT RIGHT, not a flat analog stick/pad thing. Can I get an Ouya with ONE controller etched with my username? I really don't need that 2nd controller and I'm sure some other people feel the same. In my opinion the Dualshock2 has the best D-pad ever. A fresh DS2 is what I would pick for fighting games if I didn't have an arcade stick at hand. Considering that there might be a lot of titles that use the D-pad instead of analog sticks on the OUYA I strongly recommend not overlooking the feature. It can't be too soft and not too hard. Personally I think the Dualshock 3 is way too hard compared to the DS2, and other D-pads are just too small to be accurate like the one on the Gamecube. But then we have the devil of d-pad gaming. The Xbox 360. Man that thing is inaccurate, and it feels terrible when you press it down as well. And finally, having separate buttons as d-pad is also a terrible idea. The entire thing has to follow the thumb and allow as little movement as possible to achieve optimal precision. Oh and the Sega Saturn pad was terrible. Please address the d-pad problem before the end of the kickstarter. of OUYA, this is a dealbreaker. 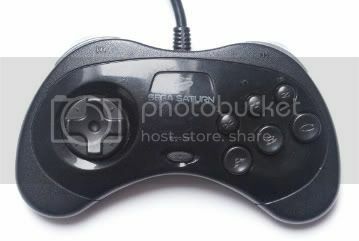 Most people would like a d-pad like the one Sega Saturn had. And then I saw the O, U and A colored buttons on the screen. Well "brilliant minds" and all that I guess. I'm sure you've thought about this before, but how about using O,U,Y & A for buttons? In any case OUYA is shaping up amazingly, keep up the good work. Hey OUYA team. As an Android developer and a gamer, I would love to see some sort of Achievement integration. The android platform currently doesn't have a well enough established universal achievement platform. It would be great if OUYA had this. Id like to know how that shape would feel.... anyways looks like the OUYA has a default of 1 usb port? Can you also work on a Fully wired usb contorller? or would we need to do this outselfs? I would love to see 2 versions of the controller: 1 that looks like the above photo, and another that looks the same with a touchpad in place of the left analogue stick and another touchpad in place of the 4 buttons on the right! 1) I wanna know if OUYA will have a "conquest" or "throphies" like Xbox 360 or Play3 system or something similar? 2) There is a login account per user? Or multiple login account? 4) Games in 720p and/or 1080p? I have dougnts and any others backers... please, reply us as soon as possible. I think having the left analogue stick in line with the right one, as many people are suggesting, is a bad idea. In the majority of modern games an analogue stick works better for movement than a d-pad and so having it in the default position is a better idea. It doesn't look as good but form should always follow function. I just want my D-Pad to feel accurate. One thing I do hate on the Xbox360 is trying to move it in a direction and have the game mistake it for diagonal because I was pushing it close to the center of the two directions when it would have been much easier if it was more precise like the plus D-Pad. It doesn't have to be the plus D-Pad, just accurate. Don't change it its not an snes or a Nintendo. I like the style were moving forward not back, just make sure it has a firm not mushy up, down, left, right, click to it & people will shut up once they feel it. The majority will not be playing games that old. The majority will be using the analog sticks and touch pad %95 of the time.